"The Trials of Van Occupanther" is surely one of the best names for an album yet. It seems reasonable to think that most people can find something to like about panthers. 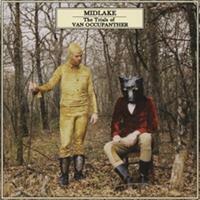 In the same way, there is much to be said about Texan band Midlake's second album. An at times fast-paced album of songs stuck between pop and rock, it carries a firm homage of sorts to 70s folk rock, particularly where the guitar work is concerned. Take for instance the solos on "Head Home", a joyous track which is smitten with easy melancholy. They sound like Neil Young is shredding one out of the speakers. What makes this reviewer land in favour of "...Van Occupanther" is the genuine warmth and feeling of the album. The organic sounds (now there's a semi-useless term...) of pianos, acoustic guitars and the slow croon of singer/songwriter Tim Smith flows so naturally it's very easy to get lost in the songs. It's an album for long cross-country train rides and similar, where you can look out the window and be quite content with your lot. Sadly, this is also the downfall of the album. Whilst listening to it, your mind inevitably drifts away from the music and onto other things. All the songs are equally accessible on first listen, and the similarities between them are things that drag the album experience on a whole down. Like so many other albums, this one too starts to shuffle its feet near the end. The "...panther" also has another flaw. Where the songs could be soaring so high you'll never crash, the production cuts it short by mere centimetres. Exactly what does this is hard to pinpoint, but there are times when it is so close to the point it's nearly painful. Title track of sorts, "Van Occupanther", is a prime example with its flutes and guitars that invoke a plethora of images. However, the first half more than makes up for some shuffling towards the finish of the album and whatever else might be wrong. Opener "Roscoe" is an instant folky winner, not only bringing joy through the verses and melodies, but also letting us remember the criminally under used name 'Rosco'. The previously mentioned "Head Home" is another highlight, if for sheer mood. I am still a bit undecided on the Neil Young solo. As the record progresses and takes yet another spin in the cd player, everything starts to glide into your ears and you start picking up on those things that makes an album truly great after many a listen. Maybe ten listens, maybe fifteen, maybe even 30. For all its flaws and slight monotony, it is a record that is hard to put down and even harder to remove from the stereo. "The Trials of Van Occupanther" might not be the absolute peak of captivating albums, but it is certainly a sweet, sweet little love affair to have on the side of everything else. This is one for when autumn rolls around.